The Springbar Highline 6 tent model was designed back in the 1960’s as an easy to pitch and spacious solution for families, car campers and hunters who were frustrated by the awkward and weighty tents of that time. The strength and durability of this tent is to be noted. This makes it ideal for use in all types of harsh weather conditions, including high winds, heavy rain and even snow storms. The lifetime warranty of this tent is also an appealing factor that will please many camping enthusiasts. Why Choose the Springbar Highline 6 10×10 Canvas Tent? This tent will certainly be a hit with those hoping to camp in the most adverse or unpredictable weather conditions. The cotton duck canvas material makes for a water resistant and mildew repelling design, so that you can use it for a lifetime if properly cared for. Regular campers will get the best out of the Springbar and repair kits are also available for easy care and maintenance. The easy and simple set up of the Springbar canvas tent is another reason why campers might be enticed to purchase. As with most tents, simplicity is often fundamental and the fuss free assembly process is certainly an advantage for this six sleeper tent. Having had some experience of Springbar tents in the past, as well as the similiar Kodiak models, the tent went up with ease and was much easier to assemble than similar models. For newbies only the part where you tension the springbars and adjust the tension screw, to create the ridge pole, might be a little daunting. But once you’ve done this a few times it becomes second nature. Watch the video above to see how easy it is to setup the Springbar Highline 6. The unique vintage look is different to most family tents you might see on the market today. A feature that will attract many buyers. This kind of design is typical of the leading canvas tent brands. The Kodiak Flex Bow as well as the Teton Sports Mesa ranges look similar with their tall straight walls and exposed supporting bar that joins the 2 gable ends. Springbar enthusiasts will delight in telling you that the all American made design was copied by those brands. The Springbar Highline features large screens on the back and sides which can make for a wonderful morning view if you’re in a particular area of natural beauty. Even in the hottest weather you won’t feel cooped up or cramped in this airy tent. The ventilation is very good indeed. Another noticeable feature is that it doesn’t have that unpleasant chemical smell when you unpack it for the first time. The same can’t be said of the Kodiak Flex Bow, courtesy of the vinyl floor. This means you won’t have to spend time airing it out for a couple of days before your trip. Though you should season the tent before going anywhere if rain is a possibility. As with every piece of camping equipment there will always be pros and cons. Conclusion – Do we rate the Springbar Highline 6 10×10 Canvas Tent? All in all, this tent is a good proposition for campers from all different backgrounds. From families to hunters, everyone would be able to find something useful and attractive about the retro looking Springbar. The main selling point is certainly the durability and stability this tent offers in adverse weather conditions. While family campers or glampers might not venture out too far or experience harsh conditions, hunters, fisherman, prospectors and all year round campers will certainly appreciate what the Springbar offers. Mother Nature has a way of surprising us when we least expect it. So even in the windiest and rainiest of storms, you, your family and friends will be safe, dry and comfortable in the Highline. 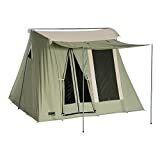 The attractiveness of the tent is also a real advantage, from the unique design to the airy back window with a view. If comfort is high on your priority list, this could be a good choice for you. However, there are a few downsides to the imported Springbar canvas tent, as the US version seems to be slightly better value for money and more robust. You would expect to pay a lower price for this version, but it’s roughly the same as the US model. Also if you’re comparing this Springbar vs Kodiak Flex Bow 6 person tent the poles aren’t quite as strong as you’d hope for as they are made from aluminum rather than steel. You could argue that they’re lighter though, it just depends whether you value strength over weight. Even with the aluminum poles the Springbar package still weighs slightly more at 74lbs to the Kodiak’s 68lb. Lastly you won’t find as many storage organizers as in other similar models. This might not be a deal breaker for many but gear loft storage and vertical organizers can be handy when space is limited. ​VERDICT ​The original Springbar design, often copied but never bettered. Superb easy setup but some minor corners cut given the price.